Power users with money to spend will have a present to buy for themselves in December: That’s when Apple’s new Mac Pro, which the company previewed back in June, will finally be available for purchase. The company announced the Mac Pro shipping time frame during an event in San Francisco on Tuesday. The $2999 configuration includes an Intel 3.7GHz Xeon E5 processor with 10MB of L3 cache and Turbo Boost up to 3.9GHz, 12GB of 1866MHz ECC DDR3 RAM (installed as three 4GB modules, leaving one RAM slot open), 256GB of PCIe-based flash storage, and two AMD FirePro D300 GPUs (2GB of VRAM each). 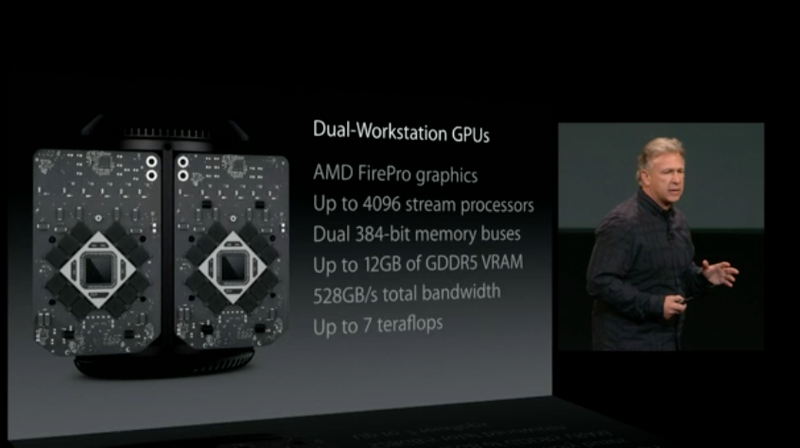 “[The new Mac Pro] is our vision of the pro desktop,” said Apple VP Phil Schiller. Apple also offers a $3999 model, which has a six-core 3.5GHz Xeon E5 processor with 12MB of L3 cache and Turbo Boost up to 3.9GHz, 16GB of 1866MHz ECC DDR3 RAM (installed as four 4GB modules, filling all of the Mac Pro’s RAM slots), 256GB of PCIe-based flash storage, and two AMD FirePro D500 GPUs (3GB of VRAM each). Apple offers a number of customization options, but as of this writing, Apple has not made available its online configurator listing the prices for the upgrades. According to the technical specifications, processor upgrades include an eight-core 3GHz Xeon E5 with 25MB of L3 cache, and a 12-core 2.7GHz Xeon E5 with 30MB of L3 cache. The RAM is upgradable to 64GB, and additional flash storage is available at 512GB or 1TB. The graphics can be upgraded to dual AMD FirePro D700 cards, each with 6GB of GDDR5 VRAM. With a height of 9.9 inches and a diameter of 6.6 inches, the 2013 Mac Pro has no room for expansion via PCI cards or internal storage devices. Mac Pro users must rely on the machine’s six Thunderbolt 2 ports and four USB 3.0 ports to connect such devices. Users of the previous Mac Pro tower who have expansion cards or internal storage that they still want to use will have to buy external boxes to house those devices—a extra cost to factor in when buying one of the new Pros. Each Thunderbolt 2 port supports up to six daisy-chained devices, so the Mac Pro can support up to 36 Thunderbolt peripherals. Once you remove the machine’s metal sleeve, you can access the Mac Pro’s four memory slots, so you can upgrade the RAM after purchasing the computer. The flash-storage card connects to a socket in the Mac Pro, so theoretically you could replace it if aftermarket flash-storage upgrades become available. Editor’s note: Updated at noon PT with more product details.